This morning’s Job Openings and Labor Turnover Survey (JOLTS) report rounds out the employment situation for March. Last week, we saw substantial downward revisions to payroll employment, revisions that exposed one of the slowest job gains in recent years. The job openings data reveal the same story: the recovery may be slowing. That said, April job growth was considerably stronger, but taking into account the most recent three month job-growth average, the economy won’t resemble the strength of the pre-recession economy (such as it was) until August 2017. The total number of job openings fell slightly to 5.0 million in March and the number of unemployed workers fell slightly to 8.6 million. 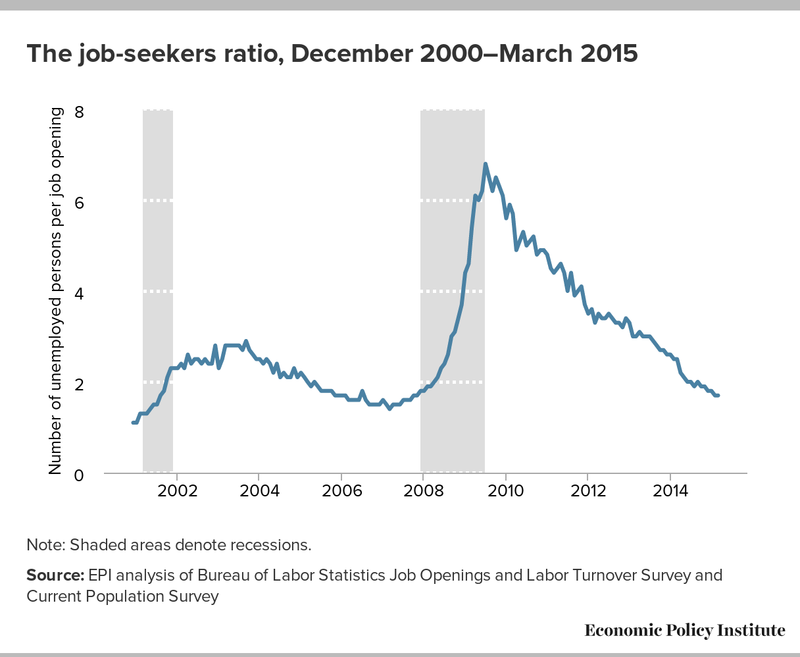 Taken together, the result was a job-seekers-to-job-openings ratio that held steady at 1.7. This ratio has been declining steadily from its high of 6.8-to-1 in July 2009, as shown in the figure below. As with the top line job openings number, the hires, quits, and layoff rates held steady in the March JOLTS report. As you can see in the figure below, layoffs shot up during the recession but recovered quickly and have been at pre-recession levels for more than three years. The fact that this trend continued in March is a good sign. That said, not only do layoffs need to come down before we see a full recovery in the labor market, but hiring also needs to pick up—the hires rate was unchanged in March. It has been generally improving, but it still remains below its pre-recession level. The voluntary quits rate rose slightly from 1.9 percent in February to 2.0 percent in March, the same rate it was in January. 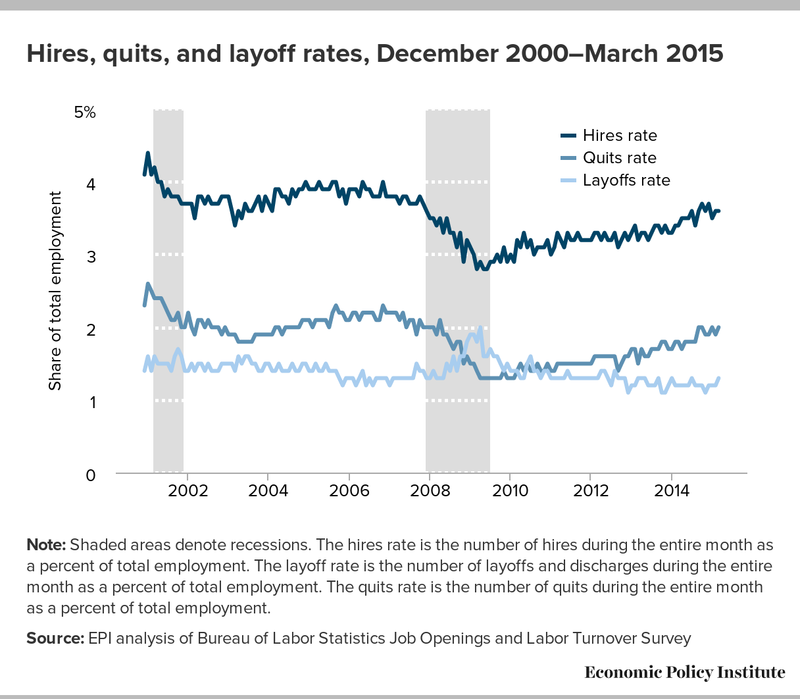 In March, the quits rate was still 4.4 percent lower than it was in 2007, before the recession began. A larger number of people voluntarily quitting their jobs indicates a strong labor market—one in which workers are able to leave jobs that are not right for them and find new ones. Before long, we should look for a return to pre-recession levels of voluntary quits, which would mean that fewer workers are locked into jobs they would leave if they could. But we are not there yet.